I’m going to walk you through the best way to answer questions about times when you failed, and how to avoid the traps and mistakes that can cost you the job offer. There are three key things employers look for in your answer, and some things they definitely do *not* want to hear, so we’ll cover everything. There are three key things employers are looking for when they ask this. 1. They want to see that you’re accountable and upfront, instead of making excuses. Show them you take responsibility for past mistakes instead of putting the blame on others. 2. Next, they want to see that you can learn from your mistakes and use the experience to get better. Everyone makes mistakes, but no hiring manager wants to hire somebody who’s going to keep repeating the same errors over and over. That drives them CRAZY. So make sure you show them what you learned from the experience and how you used it to improve. 3. Stay on track with your answer and make sure to tell a clear, concise story. Any time they ask a question that requires a story (which definitely includes a question like, “tell me about a time when you failed”), they’re looking to see whether you can tell a clear story and get from point A to point B without getting sidetracked. So don’t let your interview answers ramble on for 5 minutes or go in a bunch of different directions. Keep it on-track and brief. Describe the situation you were in, the choice you made, and how it turned out in 1-2 minutes. Then you can spend 30 more seconds talking about how you used the experience to improve in the future. One more thing – you’ll always get bonus points from a hiring manager if you sound humble, so try to do that as well. If you do those things, you’ll have a great answer that will impress the interviewer when they ask you to describe a time you failed. Now let’s look at some of the traps, mistakes, and errors that can get you rejected in an interview when answering this question. First, don’t let your answer get disorganized or go on for 3-4 minutes. Remember to be concise and brief! Also, don’t make it sound like you learned nothing from the experience, and don’t blame others. Always be accountable for what you could have done differently in the failure. Another big mistake: Not having an answer prepared and ready to go. Everyone fails, so don’t try to hide it or act like you have no failures. Prepare an example and be ready to talk about it. Also, avoid giving a story that makes you sound careless, or like someone who rushes through things and makes many mistakes in general. Hiring managers aren’t going to want to hire someone who seems like they rush and make mistakes frequently. It’s better to tell a story that shows a one-time mistake or error, rather than a pattern or repeating problem. I wouldn’t recommend talking about a huge disaster. If you made a massive mistake that cost a past company $2 million, I’d keep quiet and find a “less scary” story. So it’s a bit of a “balancing act”… Pick a real failure but don’t talk about a disaster that severely hurt your company. Next, let’s look at some sample answers so you can build confidence and practice. This example answer does a lot of the things we talked about earlier in the article. It tells a clear, concise story. It shows what you learned from the experience, and even ends with an example of exactly how you used this lesson to improve your abilities. When you finish telling them about a time you failed… don’t just talk about what you learned from it… show them with a real example. Notice both sample interview answers we just covered do this. In the first example, the story is that you told the next client their project would take 4 weeks and you finished in 3. In the second example answer, the story is that you’ve hired 8 more people since that failure, and each one has been a success. It’s one thing to say you learned a lot from a failure, but an example or story is more powerful. Talk about a real failure you’ve had, starting by describing the situation. Explain what happened clearly and quickly. Take responsibility and don’t make excuses for the failure. Show what you learned from the experience. Talk about how you’ve used the experience to become better at your job and to avoid similar mistakes. Don’t talk about anything that was a disaster for your employer. Pick a real failure but not anything too costly. Don’t share any story that makes you sound careless in general. It’s better to share a one-time failure that you quickly learned from and moved past. Be brief and concise. Keep your answer to 2-3 minutes. 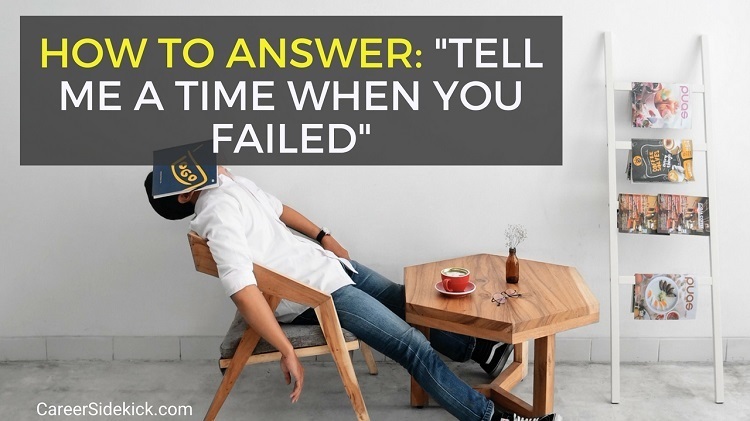 If you use these steps to answer “tell me about a time when you failed,” you’ll have an impressive interview answer that makes employers want to hire you.